November 12, 2016 September 21, 2017 by Beau H.
A much-coveted, super-durable jacket that’s ready for all sorts of fall conditions. Can you feel it in the air? Maybe? A little bit? It might just be, dare I say it … the perfect time to break out the Flint and Tinder Flannel-Lined Waxed Trucker Jacket. Now, it’s newly restocked, but it won’t be around for long. It made this site’s Fall Style Wish List, and as we’ve said repeatedly at The Style Guide, fall might just be the perfect time for menswear. 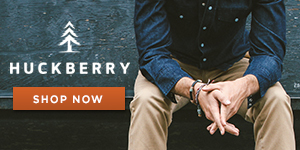 To beat the chilly k no further than the latest introduction from the great folks at Flint and Tinder and Huckberry . Part of the excellent Flint and Tinder fall collection, the Flannel-Lined Waxed Trucker Jacket very well might be your new fall )and winter?) go-to when it comes to outerwear. The season certainly did get off to a bit of a late start this year, but that’s not to say you won’t get plenty of use out of this stellar coat for several months to come. It layers up very nicely over a classic chambray shirt and it’s the ideal complement to a classic Flint and Tinder henley (wouldn’t you know it?). Oh, and you could even boldly layer it under a navy topcoat for just a dash of rugged-refined style. Why exactly should you drop nearly $200 on this waxed trucker jacket? Well, that’s easy. Sturdy hardware and a modern fit also make this jacket a great investment. Just as with all of Flint and Tinder’s stylish knitwear, the Waxed Trucker is made in America using high-quality materials and detailing that’s simply top-notch. That starts with silver hardware and rolls right on through to the modern fit and durable waxed 7oz. Martexin sailcloth. You can even customize the fit to your liking with slide buckles at the waist. Yessir, this thing is sturdy as heck. It’s cut to hit above the waist, just like your favorite spring denim jacket. But, there’s something a bit tougher about this jacket – namely, that tough waxed sailcloth exterior and flannel lining, both of which will more more than ably stand up to biting fall winds and chilly rain — or snow, if you layer it under a topcoat. It’s certainly the kind of jacket you should look to wear as much as possible (particularly given that price tag). Team it with a flannel shirt, wear it over a stylish cardigan and rock it time and again with a merino T-shirt and dark denim the next you dash out to grab coffee. Oh, and you might do well to layer it over Flint & Tinder’s ridiculously durable 10-Year Hoodie, too. It’s going to work in slightly dressier situations, too – truly. You can certainly swap this Flint and Tinder jacket out for a blazer at the office, but it’s a reliable layering piece. Give the Flint and Tinder Flannel-Lined Waxed Trucker Jacket a try sometime, ehh? It should be every bit as good as advertised – and then some. Get the Flint and Tinder Flannel-Lined Waxed Trucker Jacket as soon as you can at Huckberry.